Sometimes your high powered audio systems are going to require too much power than what your normal battery is able to produce. Lucky for you, you will find your ideal high-performance power cells right here as we offer the best car battery prices online. We also carry a large variety of auto accessories and battery chargers to help you with the installation of your high-performance 12-volt battery or power cell. WHY DO YOU NEED AN AFTERMARKET BATTERY? One of the few problems with installing an aftermarket sound system in your car is that your battery can have problems keeping up with the new power demands. This often results in dimming headlights and flickering lights inside your car with the beat of your music. Even the most modestly powered sound systems can put too much stress on your car’s battery. When faced with this problem, you have two options: replace your stock battery with an aftermarket battery or to install a second battery in your car to power your sound system. It is important to note that if your system is strong enough, you may need to do both. WHAT IS THE DIFFERENCE BETWEEN A STOCK AND AFTERMARKET BATTERY? Factory batteries are not designed to power your aftermarket system and a big reason why aftermarket electronic devices fail is due to a lack of power. A lack of power results in lower voltage, increased current and excess heat which can cause your system to burn up and fail. 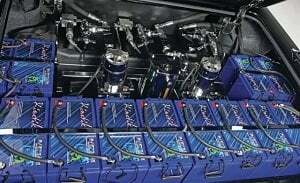 A typical car battery is the traditional lead-acid battery or advanced lead acid. These batteries are made up of lead plates inside of a solution of water and sulfuric acid. They are not sealed, which allows you to replace evaporated water and electrolytes to prolong the batteries life, but once it is fully discharged it can’t be recharged. 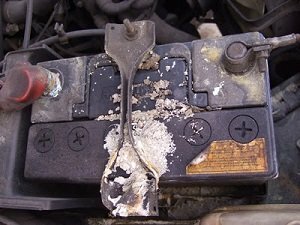 A down side of lead-acid batteries is that they can spill or leak corrosive battery acid and also require more maintenance. Aftermarket batteries are engineered for higher, more efficient power output to ensure your system is getting enough juice. Aftermarket batteries are sealed, which gives them a much longer lifespan due to the complete containment of the fluids inside. Because of the design of a sealed battery, they are also maintenance free and will never spill or leak. Examples of aftermarket battery designs include deep cycle batteries and Absorbed Glass Matte batteries. Battery chargers are also available to keep your aftermarket battery powering your system for years to come. When looking for an aftermarket car battery, it is important to know what you’re intending to use it for. Many aftermarket batteries can be used as either replacement for your car’s starter battery or as a secondary battery. However, some batteries are designed only be used as a secondary power source for your system and will not provide the necessary power to function as a starter battery. An absorbed glass matte battery (AGM) is specifically designed to stand up to repeated draining and recharging cycles better than standard batteries. One of the biggest advantages of an AGM battery is that the acid is absorbed by a fine fiberglass mat, making them spill proof. AGM batteries are maintenance free, provide exceptional reliability and are considerably lighter than flooded lead acid batteries. A battery meant to replace your car battery is known as a starter battery. These batteries are designed specifically to deliver the quick, large burst of power needed to start your vehicle’s engine. Once your engine has started, the battery will supply a much lower amount of power to keep the engine running and to operate the electrical systems in your car. Starter batteries discharge a very small portion of their capacity with each use, which gives them an incredibly long lifespan. Deep cycle batteries provide continuous power over long periods of time. These batteries are designed to be regularly discharged using most of its capacity. Deep cycle batteries are not intended to be used as starter batteries because they do not provide the same power surge that a starter battery can. Matching up your sound system to the battery you need is a piece of cake. Just add up the total wattage of your equipment and find a battery that matches cranking amps. Amp Hour: Amp hour, or ampere-hour, is another key feature to be familiar with. Amp hours refer to the capacity of the battery and are calculated by multiplying the current flow in amps by the time in hours of discharge. Amperage: Amperage measures the rate at which an electric charge passes through the battery. Adding a second battery to your vehicle electrical system isn’t the only way to upgrade it. Other upgrades to your vehicle charging system include the big 3 upgrade, adding capacitors and installing a high output alternator. Your first move in upgrading your vehicle charging system is to perform the Big 3 upgrade. This upgrades the alternator positive cable, negative battery cable and the chassis grounding cable to thick 0 gauge wire for maximum current transfer. If your lights aren’t dimming often, you may only need to add a capacitor to your system. Capacitors don’t increase power capacity, but they do lessen power demands by providing short bursts of power when needed. Adding a high output alternator will provide even more power to your sound system. Alternators provide your vehicle’s power after the battery starts the engine. Most stock alternators put out about 80-120 amps of power whereas aftermarket alternators can reach well over 300 amps. After spending all the time, energy and money on an aftermarket sound system, it would be a crime to not let it reach its full potential. Adding a second battery to your car ensures your system will always perform at its peak. 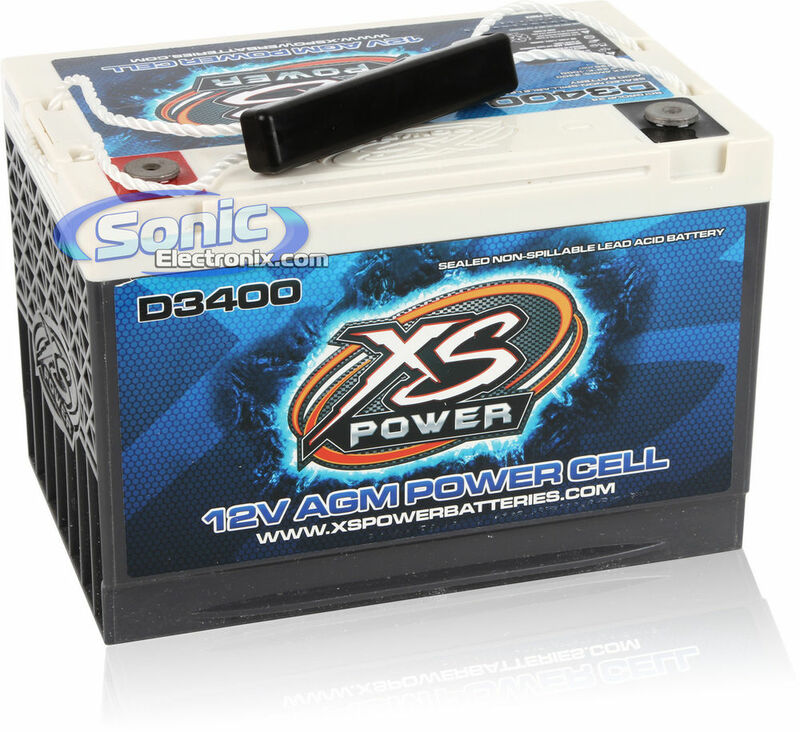 Browse the entire selection of car batteries at Sonic Electronnix. Use what you learned in this article to find the right battery for your system!